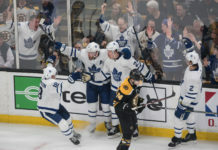 It’s likely that Dave Nonis and Brendan Shanahan will want some prior head coaching experience in one of the three upcoming assistant coaching hires, knowing the leash is tight on head coach Randy Carlyle headed into next season. There have been a few AHL candidates mentioned, however, a discussion which has included Marlies head coach Steve Spott, who just completed a successful first season coaching pro hockey, and his assistant Derek King, who has been with the team since 2009-10. Two other names mentioned by Elliotte Friedman in his 30 Thoughts column this week were the head coaches of Rockford IceHogs and Manchester Monarchs respectively, Ted Dent and Mark Morris. Dent joined the Hawks’ AHL affiliate – then the Norfolk Admirals, became the Rockford IceHogs after his first season – in 2006-07 as an assistant coach and was promoted to head coach in 2011-12. The IceHogs have not made the playoffs in three season with Dent as the bench boss, but ultimately we evaluate the success of an AHL coach by the number of useful future NHLers who have spent some time developing under his tutelage. [quote_box_center]It’s a challenge at times. We’re all competitive and wired to compete and try to win. The players and staff here in Rockford aren’t different. It’s not the be-all and win-all. The message from management down to us is to make the young players better and get them ready for the NHL. Our team isn’t built, we don’t sign players to win the Calder Cup. We’re a development team trying to get 2-3-4 players ready for the end of the year and get to the Blackhawks. We do the best we can night in and night out. To the start of the year to the finish every year, our teams get better. That’s all we can ask for. Try to get better every day and compete. There were a couple of first-round duds in the mix with Jack Skille and Cam Barker — both top 10 picks. The likes of Dave Bolland, Nick Hjalmarsson, Dustin Byfgulien and Kris Versteeg spent a season and change each with Norfolk/Rockford; all successfully graduated and were ready to make an impact quickly – Versteeg posted 57 points in his first 92 NHL games, Bolland posted 64 points in his first 120 NHL games, Byfuglien posted 19 goals in his first full season (as a converted winger). Some of the success cases who spent significant time in the AHL include Troy Brouwer, Bryan Bickell, Corey Crawford, Ben Smith and Brandon Bollig. We can likely put Brandon Pirri (traded to FLA) on this list as well. While serving as head coach the past three seasons, Dent has coached Andrew Shaw, Nick Leddy and Brandon Saad for quick stops in the AHL, and Pirri and Smith for longer stays with Rockford. When it comes to manufacturing useful NHLers drafted out of rounds 2-9 especially, development in the AHL is a part of the puzzle. The Hawks have done a good job of supplementing their high-end draft and trade-acquired talent with the successful drafting and developing of players out of the lower rounds, of which Dent has played a role. It doesn’t mean he’s the reason these players became quality NHLers or even that he’ll make a good NHL assistant coach, but if you’re looking for a fresh-blood up-and-comer type of candidate who has spent some time working for a team with a successful player development system, Dent qualifies. Along those same lines is the Manchester Monarchs’ Mark Morris, except he’s been a head coach in the AHL for longer, since 2006-07 to be exact. Having received a one-year contract extension last summer, it’s since expired and Dean Lombardi has said he is respecting Morris’ wishes to take the next step with his career. Just this past season, Morris became the first coach to record 300 career wins at both the collegiate (Clarkson University) and professional level. The Monarchs made the playoffs in all eight seasons under his watch, twice reaching the Conference Finals and most recently bowing out in the first round after finishing first in the Eastern Conference during the regular season with a 48-19-3 record. Morris briefly held an NHL post in 2003 when he served, under head coach Marc Crawford, as the Special Assistant Coach/Interim Strength and Conditioning Coach for the Vancouver Canucks. Dave Nonis was the senior Vice President and Director of Hockey Operations of the Canucks at the time. Among the players to emerge under Morris’ watch who have spent significant time with the Monarchs: Forwards Trevor Lewis, Matt Moulson, Brian Boyle, Teddy Purcell, Dwight King, Jordan Nolan, Tyler Tiffoli and Tanner Pearson; defencemen Vyacheslav Voynov, Alec Martinez, Jake Muzzin (less successful with Colton Teubert, now in Europe, and jury’s out re: Thomas Hickey); goaltenders Jonathan Bernier and Martin Jones. Linden Vey, a fourth round draft choice of LA, received a few callup stints with LA this past season and has been putting up big-time numbers in the AHL. 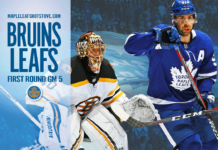 How can the Toronto Maple Leafs beat the Boston Bruins?